Learn How to Create Better Business Systems! You pay $19.95 and take the Box Theory™ eCourse. I will teach you how to create high-performance business systems and processes that will pay you back 10...100... even 1000 times the cost of this course. . . No baloney! See Price Page for Special Offer! Learn how to become a "Systems Thinker" and solve every business problem that arises, including low profit, poor cash flow, weak sales, customer dissatisfaction, employee turnover, excessive costs, and every other business frustration. Add thousands of dollars to your bottom line by reducing waste and inefficiency, and boosting worker productivity. Discover seven system attributes that will transform your company into a high-performance organization—one that attracts customers and generates exceptional profits. Learn how to focus on the vital few facets of your business that will bring the biggest payoff. Discover a simple scientific formula that will change your business, and perhaps your life. It is the true "magic formula" for success in any endeavor. And no, it's not "the Secret" you've heard so much about. It's better! Master the fundamental principles for improving everything. Learn how to create a results-driven culture that operates in high-gear even when you're not around. Create loyal customers who will spread the word about your exceptional organization. Prepare your business to sell, franchise or have others run for you. The Box Theory™ method transforms these often complex and expensive business process management techniques into a simple and intuitive solution for busy people on a limited budget. After one of my two-day system development workshops ($1000), I walked a young entrepreneur out to his car. He said to me, "I finally understand what I should be doing as a CEO!" He got it! This is a course for CEO's and others who want a clear path to creating an outstanding business organization. I could only reach a few people through workshops, so I decided to package the information into an eCourse and make it available to many. A software product, Box Theory™ Gold, is also now available. I am hoping that you too will soon become a Box Theory™ enthusiast! activity, including marketing, finance and operations. Box Theory™ is a one sentence statement with profound implications. I won't reveal it here, but just know that it is elegantly simple, yet remarkably powerful. How to design an efficient and smooth-running system, with all of its essential components and high-performance attributes. How to guarantee quality, efficiency and low cost with systems that consistently deliver the results you expect. How to effectively deploy new systems and properly measure performance. How to create a culture of excellence with highly motivated people who enjoy the game and play to win. and produce a dramatic improvement in cash flow and profitability! You could too, after taking this Course! The Box Theory™ method is easy to master and fun to apply. But, plan on some serious learning. This is not fluff! You will gain knowledge and skills in a few short hours that have taken me a career to discover. The journey has brought me to a point of exhaustion and joy—something like climbing Mount Everest, I suppose. While I don't want to deprive you of these same growth-producing experiences, I do want you to learn from my mistakes and climb higher than you ever thought possible. I strongly believe that Box Theory™ can catapult you light-years ahead of your competition! Everyone is in a different place with different business goals. Box Theory™ is suited to all stages of development. Do you want to start, grow, fix or franchise your business? Box Theory™ is the only tool you need to organize and structure a new business that runs smoothly and impresses customers right from the start. Box Theory™ will teach you the best way to dramatically grow your business, and the only effective method to skillfully manage that growth. 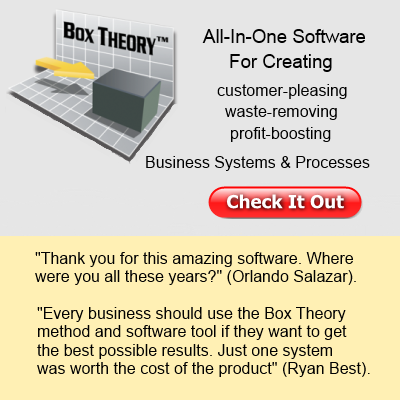 Box Theory™ will show you how to cut the waste, inefficiencies and fat out of your business; you'll put more money into the pocket of your stakeholders. Box Theory™ will turn your business into a self-running system that gives you consistent results day-after-day. Let someone manage it for you or replicate it in other markets. Are you are interested in learning the Master Skill that will change the way you do business? Are interested in a little investment that pays Huge Dividends? Are interested in creating a World-Class organization? Then sign up today for the Box Theory™ eCourse. Let me repeat my offer to you! 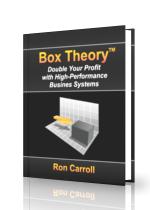 You pay $30 and download Box Theory™: Double Your Profit with High-Performance Systems and Processes, and I will show you how to create business systems that will pay you back $300... $3,000... even $30,000 - No baloney! I am also going to throw in 25 Bonus Worksheets that will save you time and get you off to a fast start!